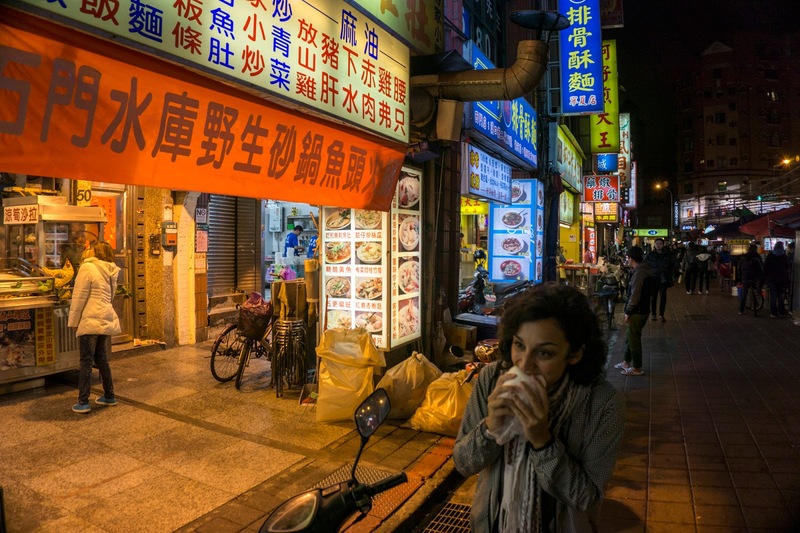 A five hour night flight from Delhi to Hong Kong, a three hour layover, then a 90 minute flight to Taipei where we stayed for five nights. 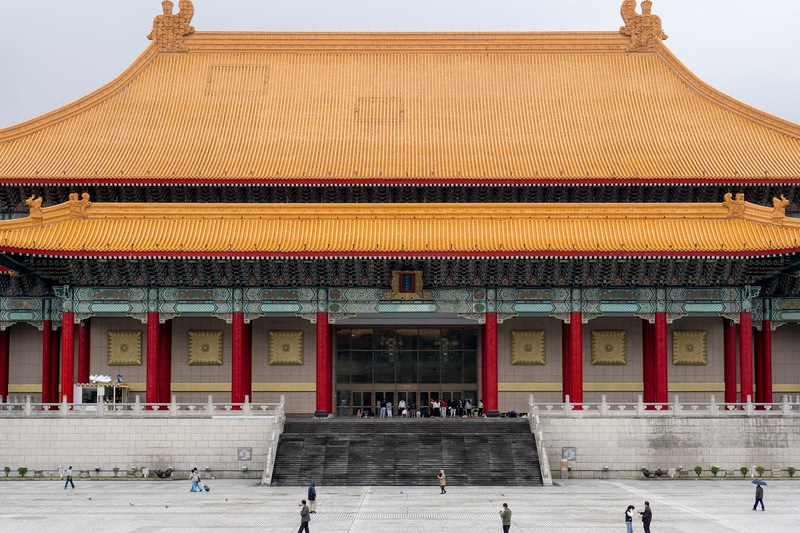 Take the wide avenues, high-end shopping streets and yellow taxi cabs of New York, add the cleanliness, technology and spot on service of Tokyo, mix in a whole lot of friendly smiling faces, and you have the unhurried but vibrant capital of Taiwan that is Taipei. 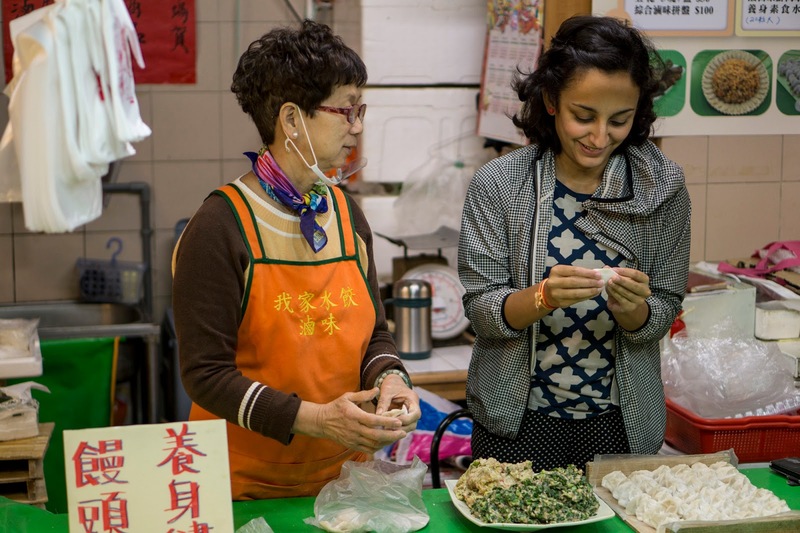 Whenever I speak to people travelling around or visiting Asia, hardly any have Taipei on the itinerary; it is surely one of the most under-the-radar cities in the region. Why more people don’t visit, I don’t know – we were the only westerners in a whole load of queues at the arrivals gate. The tourists seem to mainly be from Asia, and as my British Taiwanese friend said, ‘the whole of Asia knows about Taipei – they love visiting. Europe is yet to discover it’. But visit people should, because it’s excellent. It also reminded me a lot of Tokyo / Japan – the bowing, the whizz bang toilets with seventy-five functions, the fashion and cuisine, the slick subways, the incredible bakeries, the pristine produce. And it turns out my observations weren’t too far off; I was told my a local that Taiwan is influenced by the culture of Japan more so than any other country in Asia. 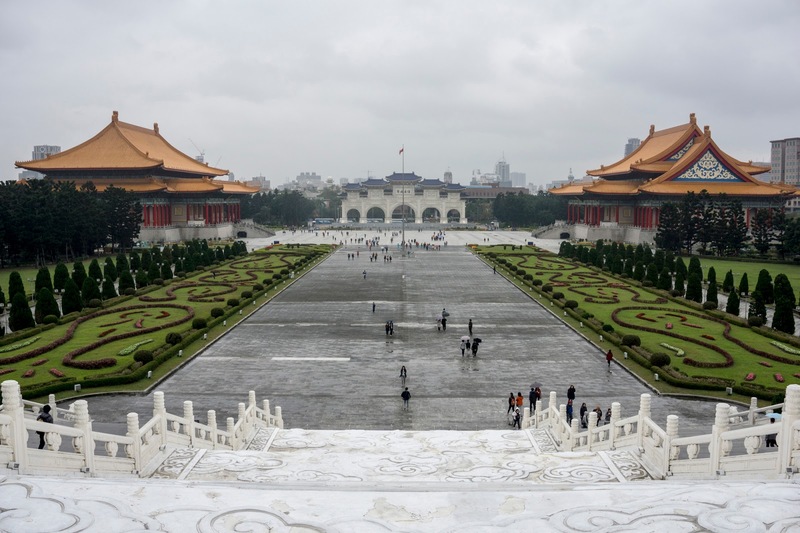 The two also have a very good relationship, Taiwan often donating towards natural disasters across the water, and the Taiwanese are a lot more friendly to the Japanese than the Chinese (I was told), so the number of Japanese tourists in Taipei is high. But Taipei has many merits of its own, and I think is just beginning to have its coming-of-age party. People are talking about it more, certainly back in the UK, and it’s dining scene is beginning to draw visitors from further afield. 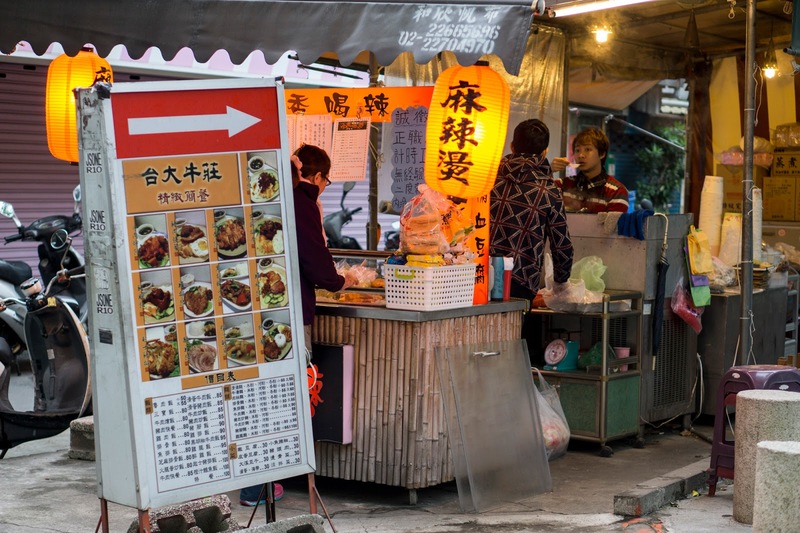 On the note of dining, I got in touch with the Taiwanese tourist board to see if there were any local foodies who might fancy spending an evening with me, pointing out their favourite eating spots in exchange for a beer or two. What they sent me was author, bogger, TV and radio personality, and all round famous foodie Feichi, who is pretty big time in Taiwan. Every time I mentioned her to someone, they knew who she was. She was huge amounts of fun and through her excellent grasp of broken English, we spent a good day and a half together, where she showed us some of her favourite spots in town. A huge thanks to her for giving up her time to do so. 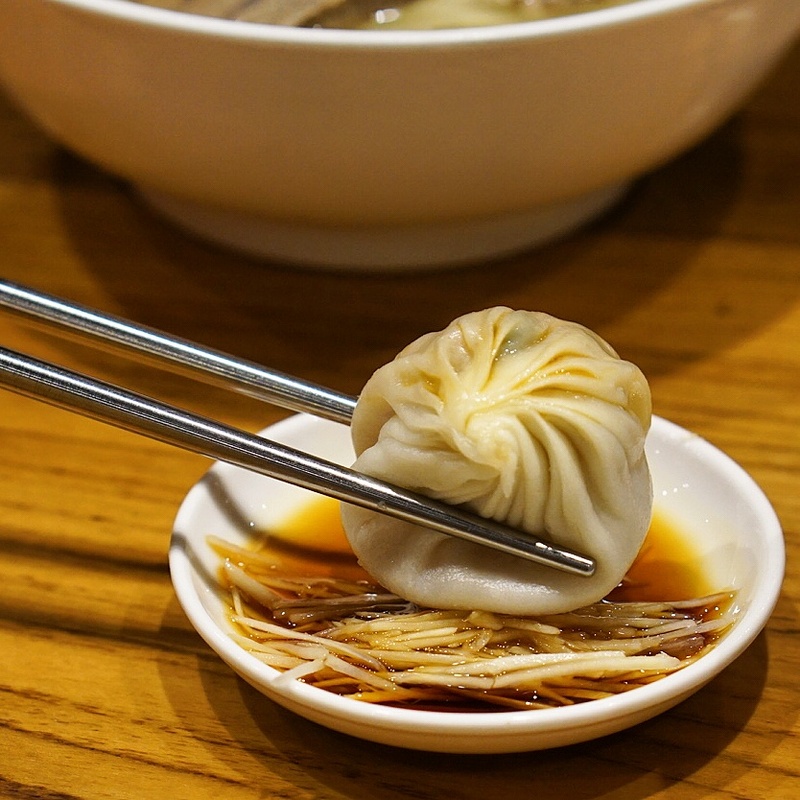 Pork xiao long bao at Din Tai Fung. After several people insisted we visit a branch of Din Tai Fung, we realised there was one a five minute walk from the hotel, handy for a late check-in on our first night. 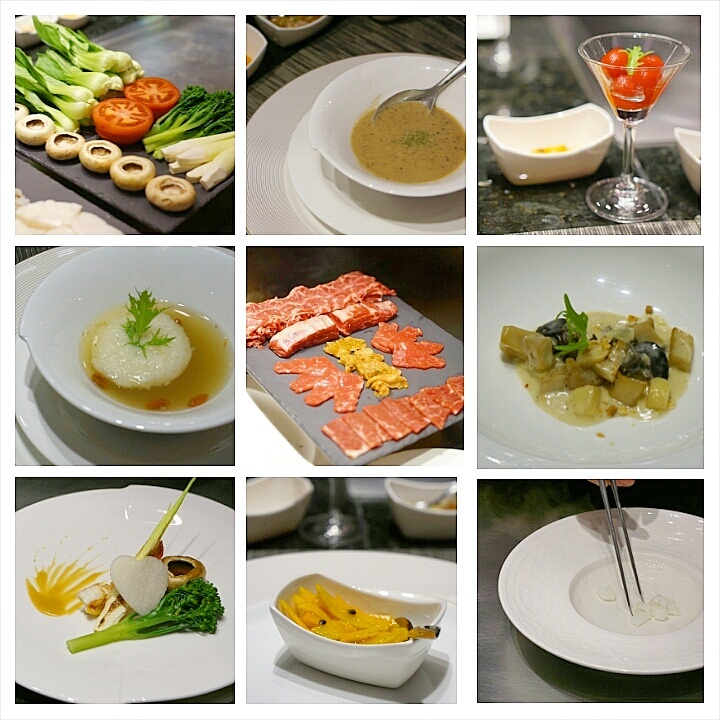 Two of their branches in Hong Kong each hold a Michelin star – I plan to check one of them out and compare next week. 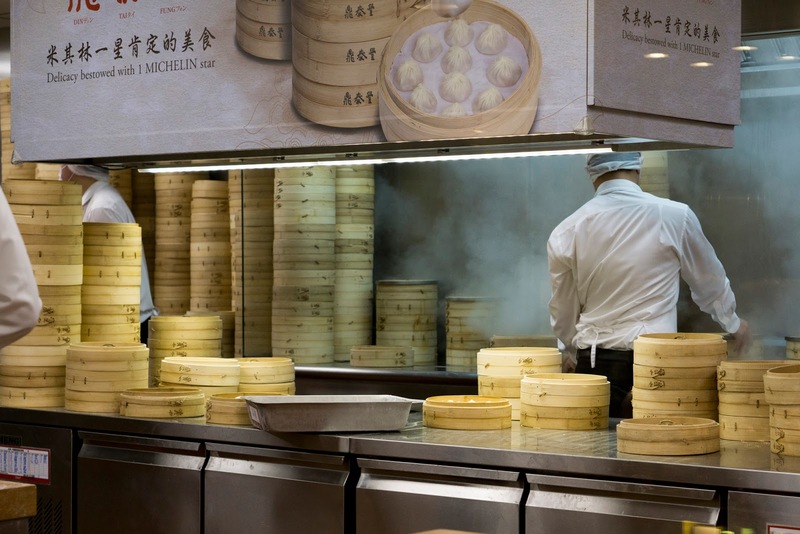 In the meantime, their pork xiao long bao were quite fantastic – delicate dumplings with impossibly thin skins, enclosing seasoned ground pork and a thimble-full of stock, dipped in a soy, ginger and vinegar mix. 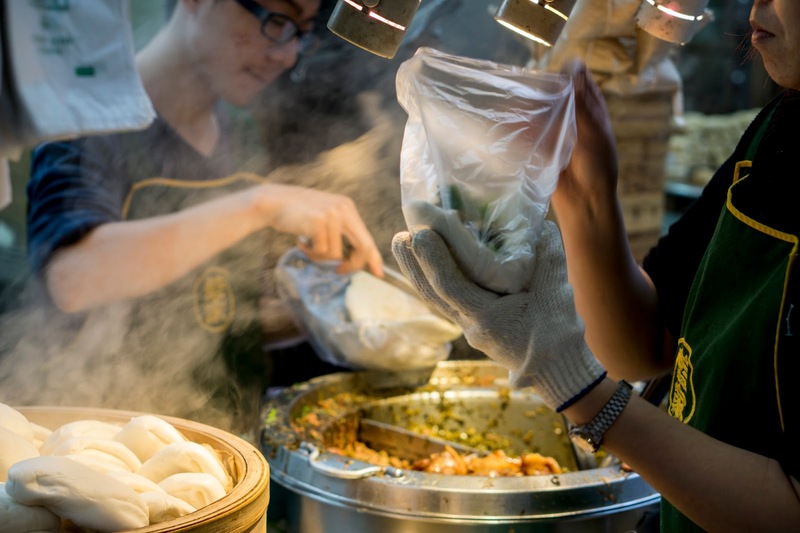 Diners can watch a team of enthusiastic chefs busy rolling and stuffing and pleating with the kind of speed, dexterity and repetition that hypnotises. Each chef creates 20 per minute, and each is meticulously and perfectly pleated exactly 18 times to seal the package. Taiwanese teppanyaki at HoTing. 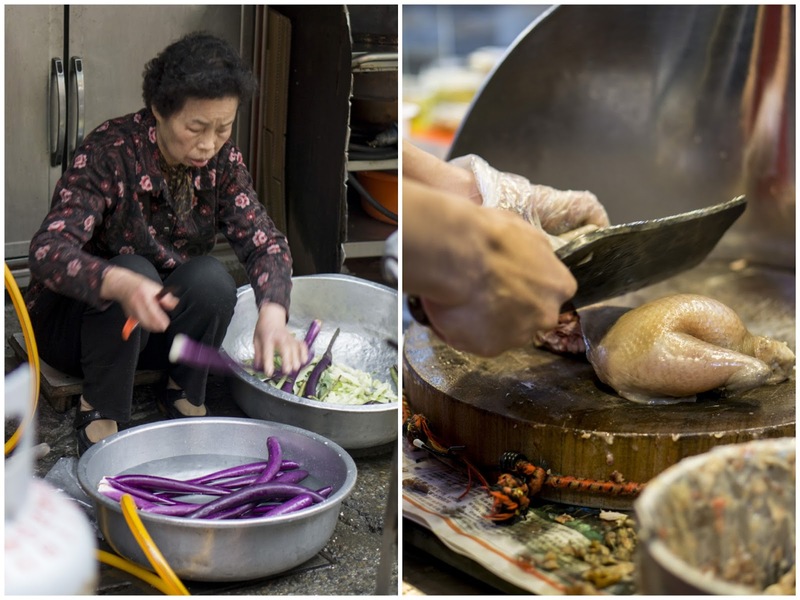 The love for teppanyaki in Taipei started about 40 years ago when a Japanese restaurateur came over, opened up shop, and shared this traditionally Japanese cooking method with the locals. 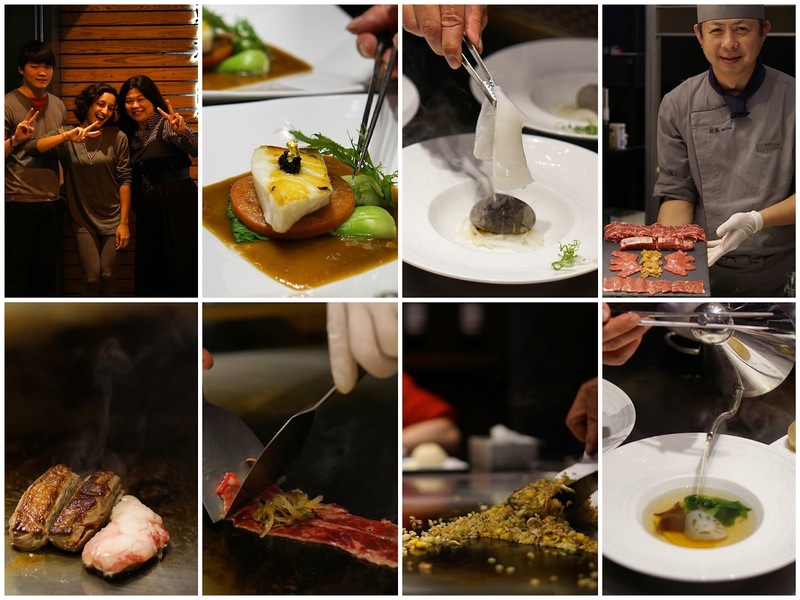 The master who taught the chef at HoTing was himself taught by this first Japanese grill maestro in Taipei. Teppanyaki is about grilling food on a flat iron plate, similar to a la plancha in Spanish cuisine. In both cases, the quality of the ingredients should steal the show, and the skill of the chef in applying the right amount of heat for the right amount of time should bring them to life. 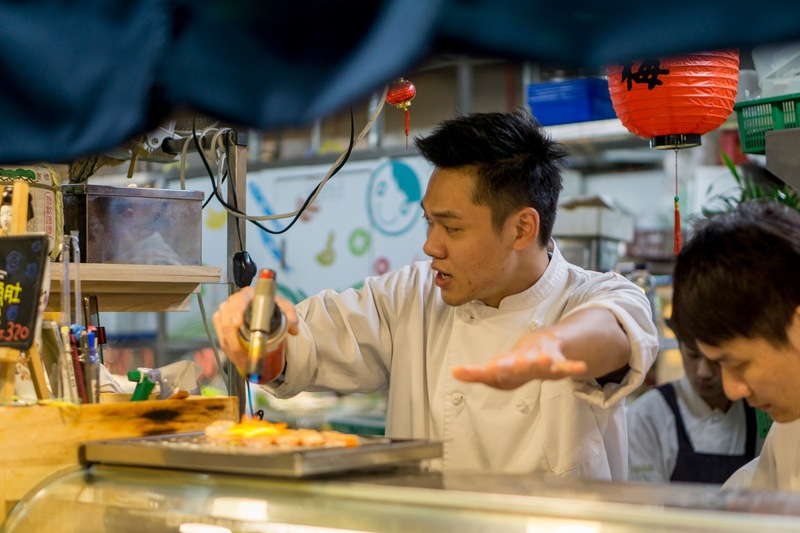 HoTing focuses on all the right things – ingredients, presentation, and service, with the completed dishes being a happy collaboration of Taiwanese and Japanese, seasoned with a touch of French. Before the grill got to work, we had a series of appetisers and starters: snails in a truffle cream sauce with crushed hazelnuts; pumpkin in a passionfruit sauce which we wrongly guessed was mango; blanched freshly killed squid; skinned baby tomatoes in a plum syrup; and a very Japanese scallop and Chinese yam soup. Then there were some real stand-out dishes. Snow fish – like massive meaty cod, but much sweeter – grilled on the teppanyaki until its sugar content caramelised the edges, was marooned in a sea of oyster and onion sauce that had cooked down for four hours, with a caviar top hat and that flourish of decadence every plate needs (not), gold leaf. Regardless, this was great. 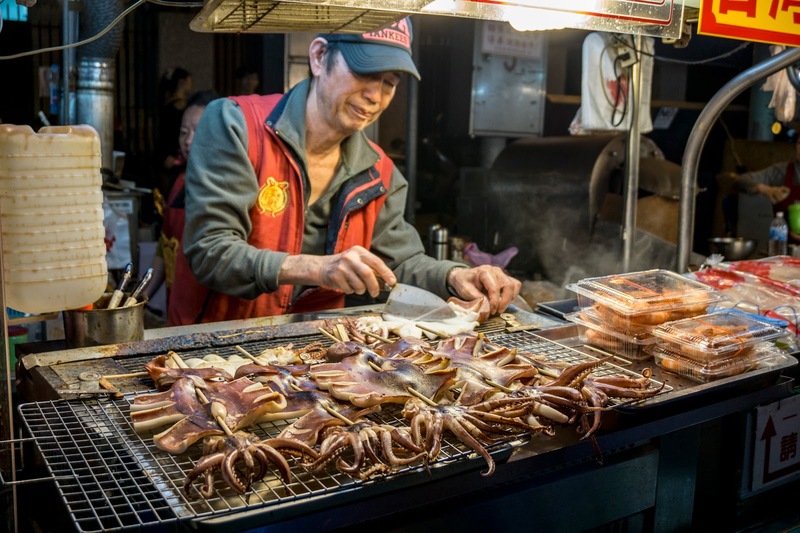 Then there was really fresh squid, with some DIY cooking on a scalding hot stone, the flesh sizzling and curling as it came in contact with the heat. There was a cap of premium rib eye (the highest grade you can get, the chef tells me) where some of the muscle skin was left on and fried until it got aromatic and crispy. It was cooked with beef fat rather than oil, and rest of it pretty much melted onto my tongue. Chef-made kimchi was rolled up in a thin slither of beef, grill heat applied, and served with sliced and hot soy-pickled chillies. There was also egg fried rice, and I’ve not had it as good as this before. The large surface area of the grill meant every grain stayed separate from the rest, each with spot on seasoning. In it, pork, corn, garlic, spring onions, fish eggs. Vegetarian lunch at Pin Sheng 品盛悅素軒. 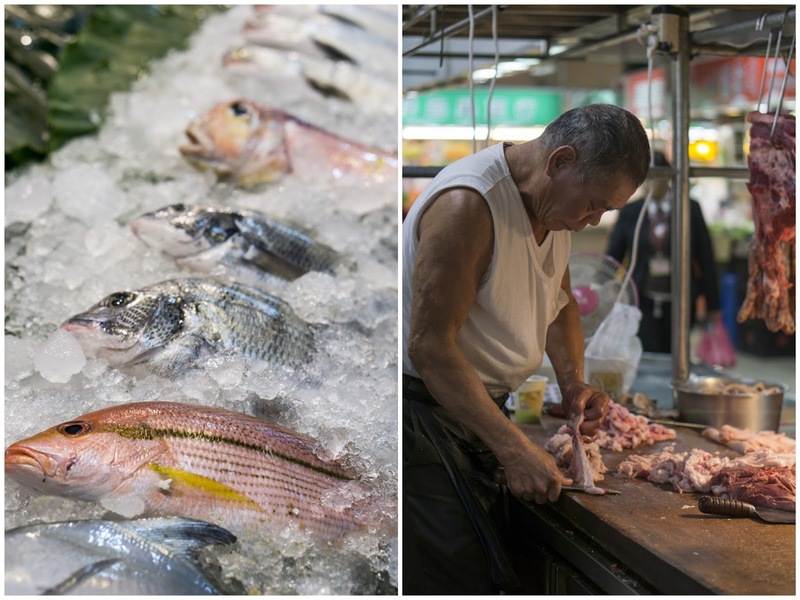 One thing I’ve noticed about Taipei, and in a similar vein to Japan (again), is that the quality of produce is really very good. 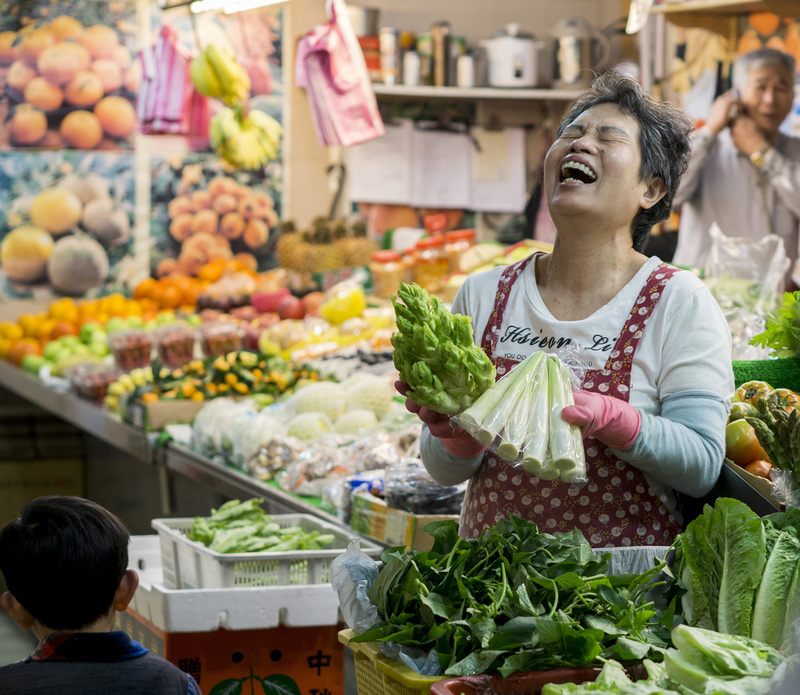 Agriculture is big in Taiwan and there are a whole host of both familiar and exotic fruit and vegetables that grow here. Lunch involved a series of exquisite, vibrant dishes, beautifully presented (molecular gastronomy techniques appeared in a couple), purely vegetarian and full of flavour. Something like 80% of the ingredients used are grown in the country. 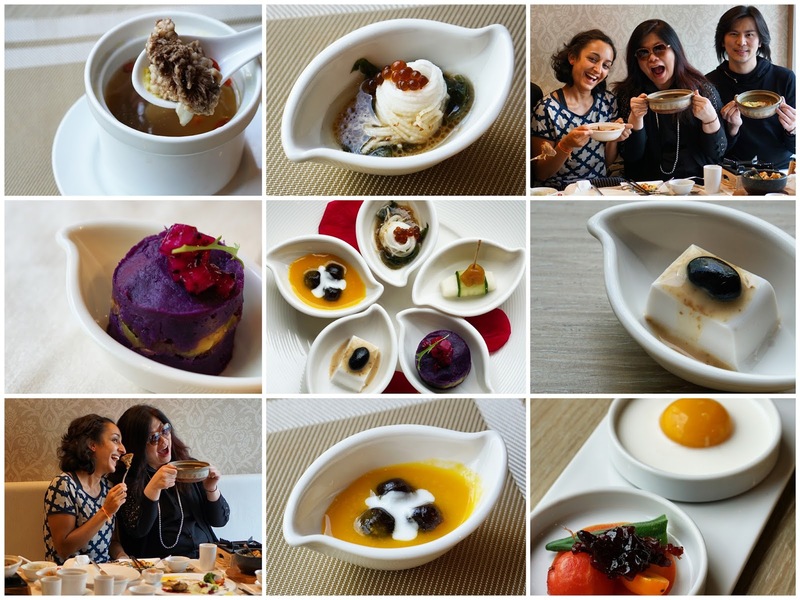 Appetisers included mango and yoghurt made to look like a fried egg; tofu with red bean and sesame; purple sweet potato with avocado and red dragon fruit; Chinese yam noodles with soy sauce caviar and seaweed, and a load of other things I can’t possibly remember. They were coming out faster than I could eat them / jot down notes about them. From the bigger dishes, malva nuts cooked in a snail dish, smothered with cheese – they were orange, the texture of cooked chestnut and quite delicious. There was a hot bowl stuffed with gorgeous tofu and a load of beautiful vegetables, simmering in stock and not much else – nothing extra needed, and Korean bibimbap with more vegetables. There was sanbeiji, which is three cup chicken, with loads of garlic and ginger, but here with tofu and mushrooms instead of the meat. And then there was my first experience with monkey head mushroom. The most meat-like non-meat thing I’ve ever had. A huge steak in the middle of a plate, dense, heavy, juicy, and with a crust – quite fantastic. Pineapple cake from Sunny Hills. You can’t walk five feet in Taipei without coming across pineapple cake for sale. 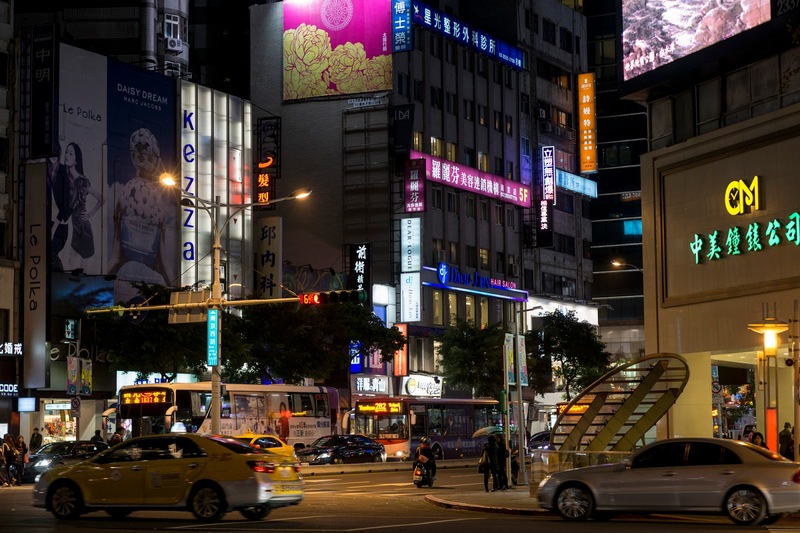 According to Tourism Bureau statistics, shopping represents 50.6% of consumption by foreign tourists in Taiwan, and the top items that these foreign shoppers purchase are pineapple cakes. This ubiquitous teatime treat is a hugely popular choice to buy as a gift (there’s a big gift-giving culture in Asia), and bite-sized pieces come individually wrapped and beautifully packaged in larger boxes. They’re not quite cakes as we in the UK might know them. They’re oblongs of crumbly buttery pastry that encase pineapple flesh that’s been boiled down with some sugar. The folk at Sunny Hills use high grade Japanese flour and the eggs in their pastry are from chickens pampered with state of the art German equipment that create a more than ideal environment for them, which also includes classical music wafting through the hen houses. I bit into a fair few cuboids of pineapple cake during my time in Taipei, and I have to say, the ones from here were particularly good. Not too sweet, the pastry had a great crumb, and their Taipei café is a really nice spot to sit for a while. Not to mention the fact they give every customer one piece of cake and a cup of tea for free; whether you then choose to buy some to take with you is irrelevant. 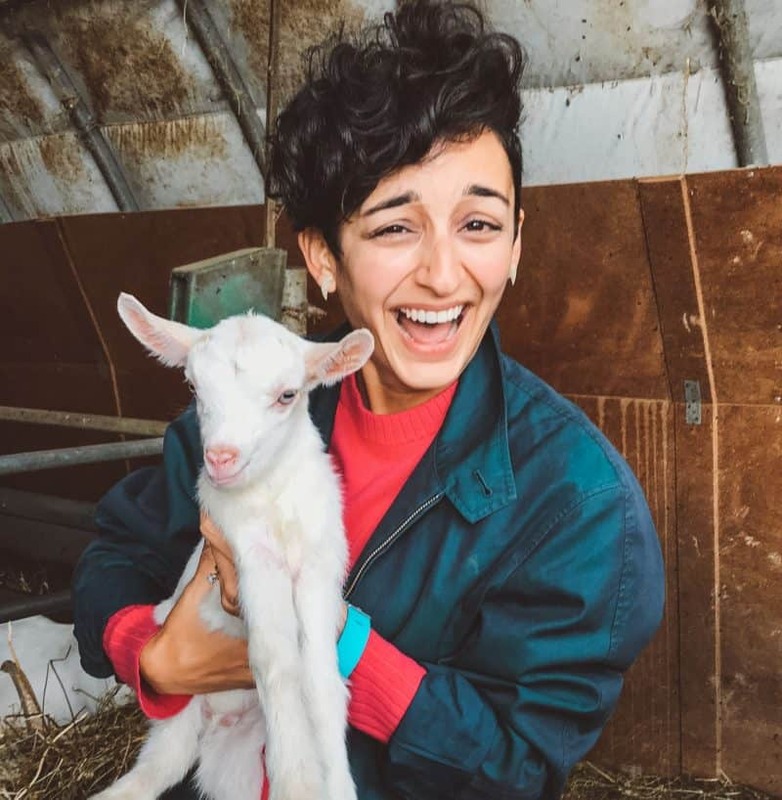 A clever way to create a welcoming environment for everyone, and it doubles up nicely as an effective marketing tool – people were leaving with crates of the stuff. Beef noodle soup from Richie Chen. You know it’s an obsession when it gets its own festival. in chefs. Everyone wants to claim the title of beef noodle king. 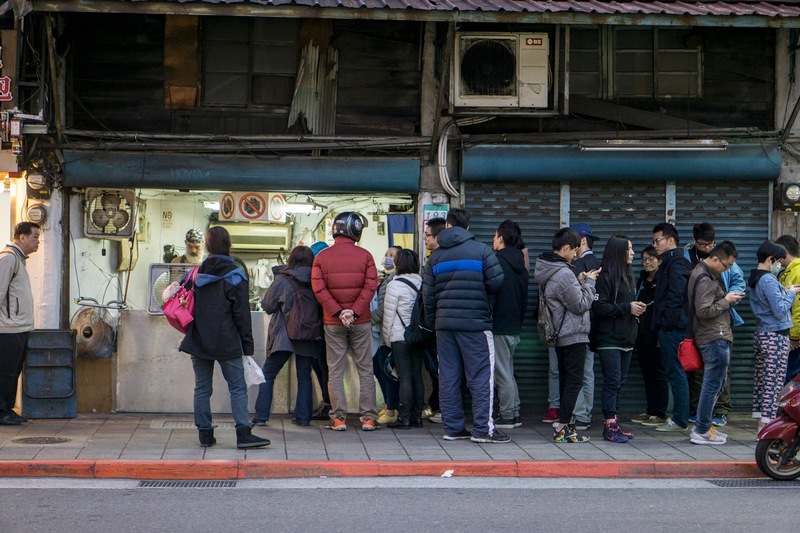 Bowls range from the silly (£220 at one particular place in Taipei) to cheap as chips makeshift noodle shacks. 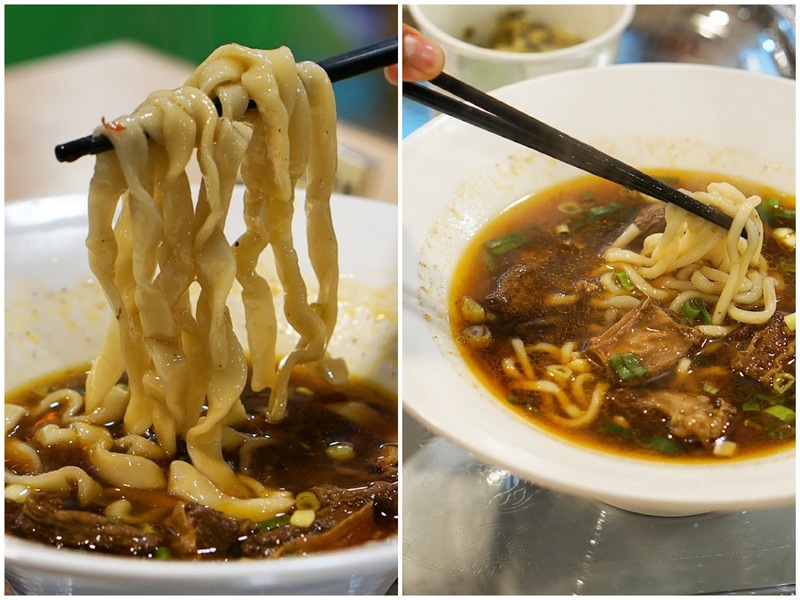 Either way, it’s quite difficult to have a bad beef noodle experience in Taiwan. 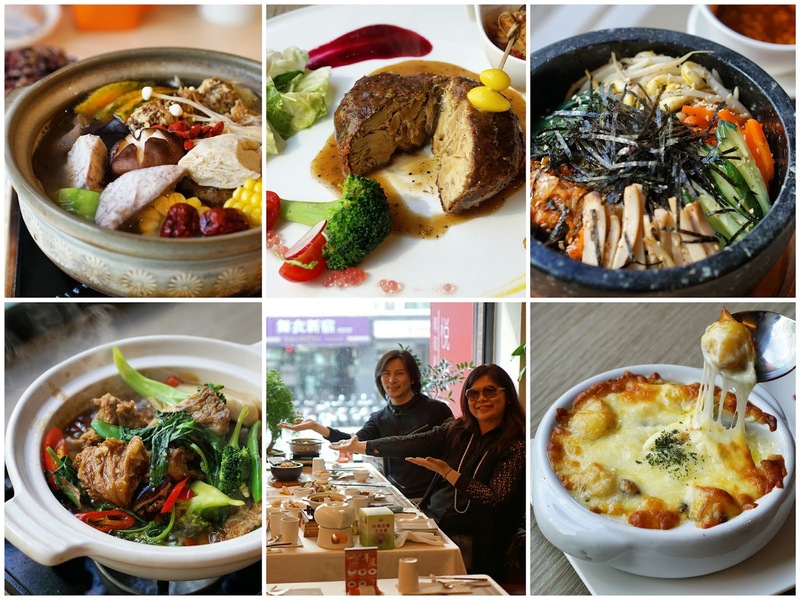 Feichi took us to a perennial favourite run by chef Richie Chen, who’s found TV fame and won awards for his concoction – succulent beef shanks and al dente noodles in a herbal soup. Very good. Dried fruit from Love Flower Fruit. This is a great little business, and the sort of thing that must be pure pleasure to run. 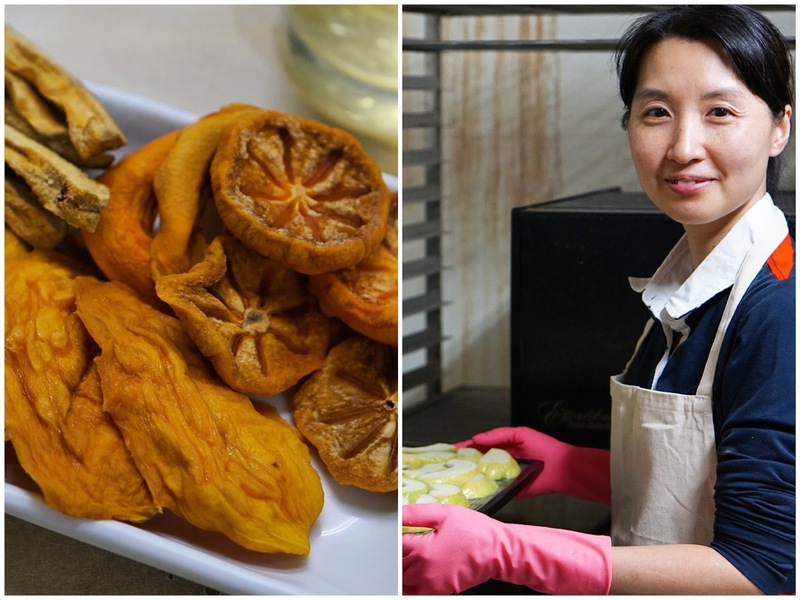 Another example of a good gift to give (see pineapple cake above), dried fruit is a popular snack in Taiwan. The ones from Love Flower Fruit are simply washed, sliced, laid on wire racks, then dehydrated in machines for the best part of a day. Nothing is added – no sugar, no preservatives. They’re then sealed in packs and shipped off to customers. Pretty much every fruit that isn’t just water is available dried – mango, persimmon, guava, apple, banana, papaya, pear, pineapple, and so on. 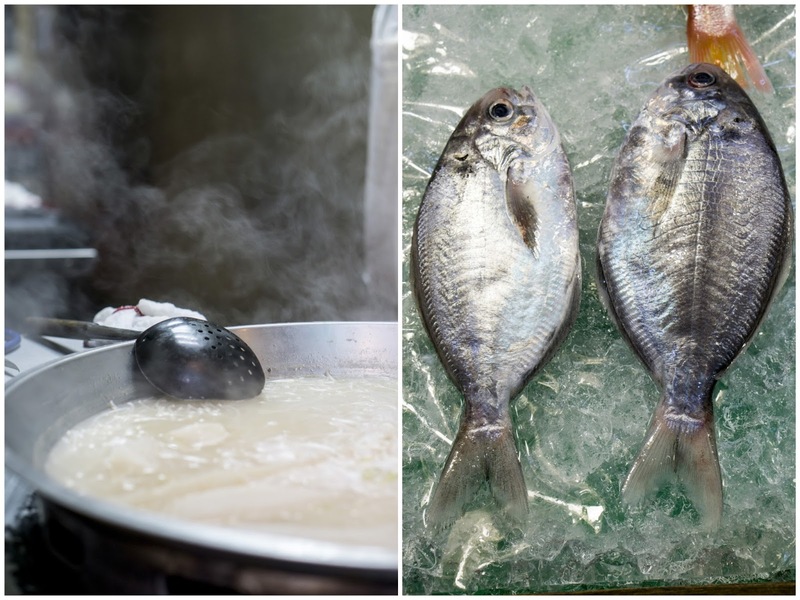 On a whole, I found the night market street food in Taipei to be a bit too sweet for me – lots of sugary sauces – give me salty and umami any day. I tried the oyster omelette (oar-ah jien), oyster vermicelli (oar-ah mee-sua), and a sausage wrapped in rice, and they all fell into this category. But there were a couple of things that were very good indeed. Pork belly buns (gua bao). This is a burger, Taiwanese style. It’s soy sauce stewed pork, peanuts crushed with sugar, preserved mustard greens, coriander, all in a fluffy steamed bun. The filling is chopped up into small pieces and mixed together so there’s a bit of everything in every bite. I had one at Lan Jia Gua Bao (No. 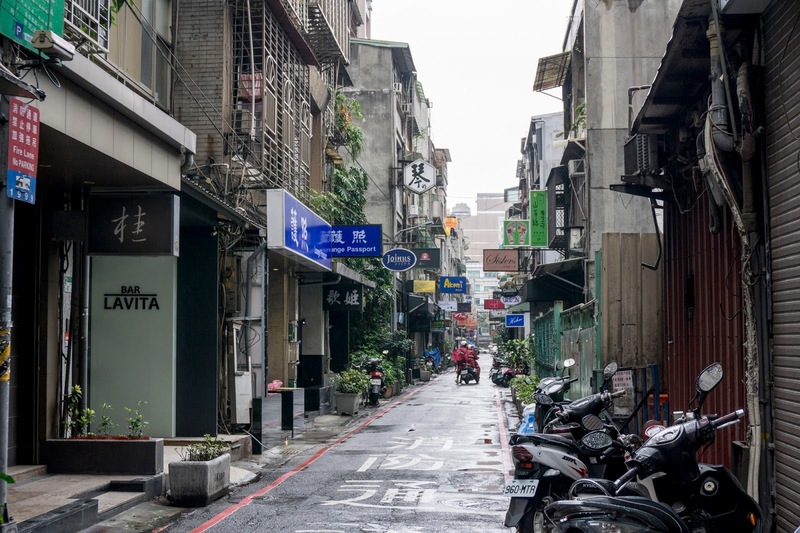 3, Alley 8, Lane 316, Roosevelt Road, Sec. 3), generally acknowledged as serving some of the best in town. They were certainly good, and won at value (about £1 each) and portion size, but I have to say, in terms of flavour, the ones from Bao London were better. But then I had another one, on a different day, at Ningxia night market, and this time it was excellent. Turns out the this one was full fat, whereas we had specified fully lean before. That would explain the increased deliciousness, then. Blood rice cake (zhuxie gao). 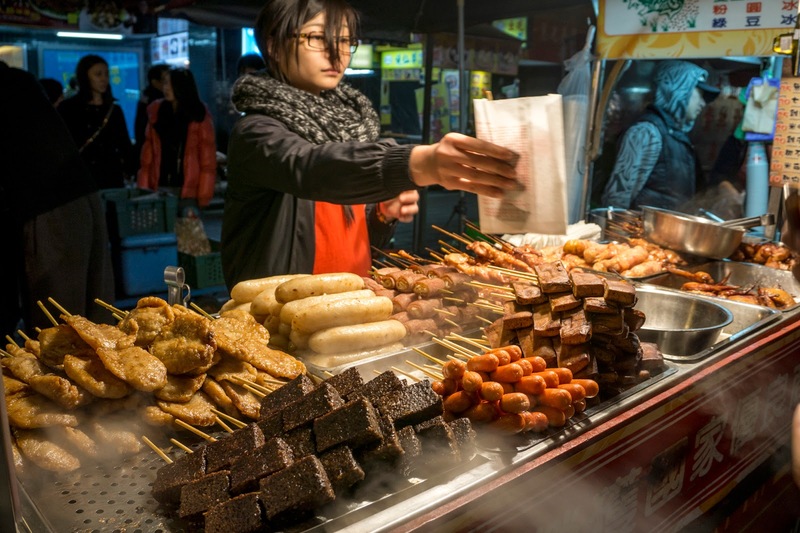 This was on the street food hit list given to me by my Taiwanese friend in the know, and I do love a good black pudding, so I made a beeline for it. Coated with peanut powder – savoury, salty, nutty – very good. Also had at Ningxia night market. Bubble tea (zhenzhu naicha). 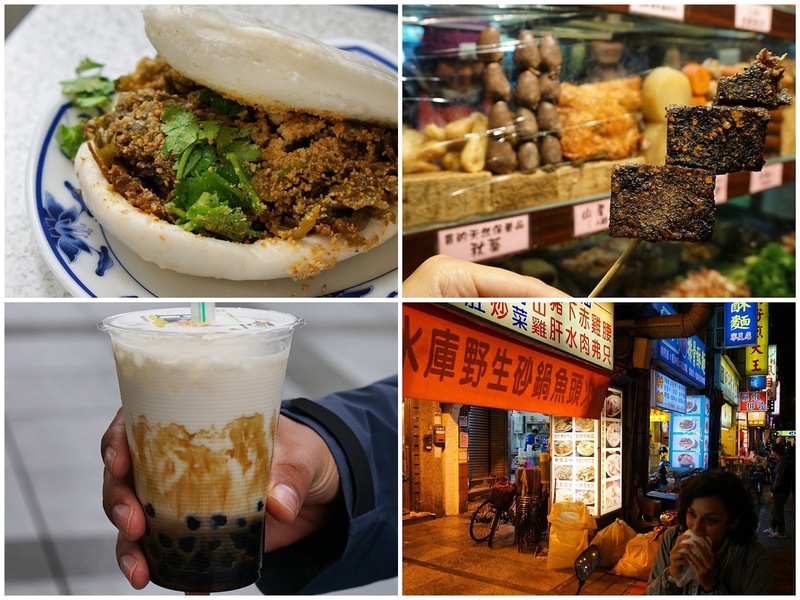 Also known as pearl milk tea, this is the drink Taiwan is most famous for, with trends taking off in other major international cities, including London. It’s fresh cold milk and warm tapioca balls (the ‘pearls’ or ‘bubbles’) that have been stewed in brown sugar, topped with ice, so there isn’t actually any tea in these ones. The bubbles have a really good caramel flavour though, and great chew, and the contrast in temperatures was good. Although I’m still not sure if I like the sensation of the balls coming up the straw into my mouth – still feels like I’m sucking up a fly that’s fallen in. Apparently you can customise your bubble tea, with smaller balls available from some places, so I might do this next time. Had at Chen San Ding, the most popular bubble tea joint in the student-heavy area of Gong Guan. 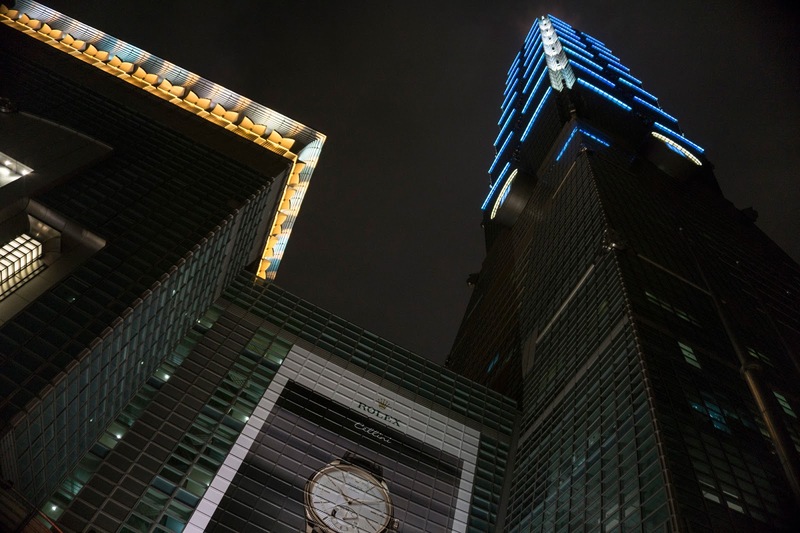 Taipei 101 is one of Taipei’s most conspicuous and impressive landmarks, a great big massive skyscraper. It was the tallest building in the world between 2004 and 2010, still has the fastest elevator on the planet (37.7 mph ascending speed), but more impressively – and very pleasing for the physicist that still lurks somewhere deep within me – it has the world’s only tuned mass damper that’s on display to the public. 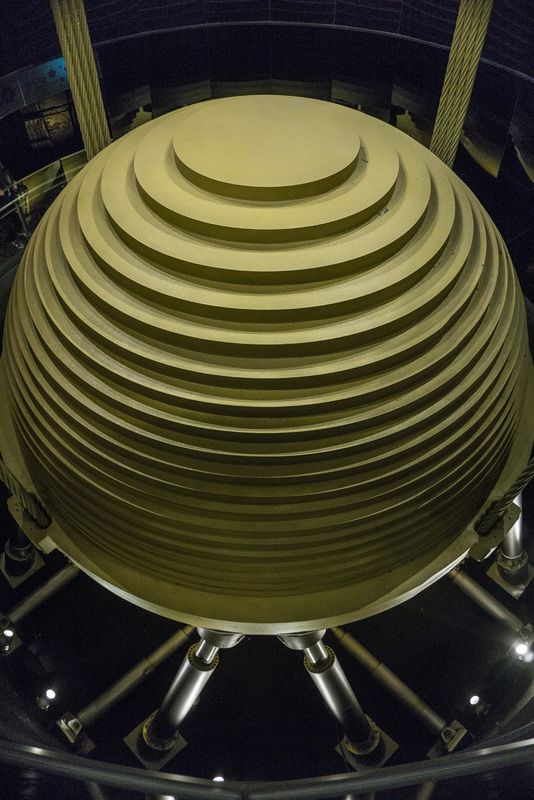 Tuned mass dampers are in most tall structures, in different shapes, sizes and designs, and are critical component of the building design. They are there to counteract and therefore reduce the sway of the building during earthquakes, typhoons and so on. This one is a massive 660-tonne steel pendulum suspended from the 92nd to the 87th floor by eight steel ropes, moved by hydraulic pistons. In every other example in the world, they are hidden within the structure of the building, but not here. Cool. 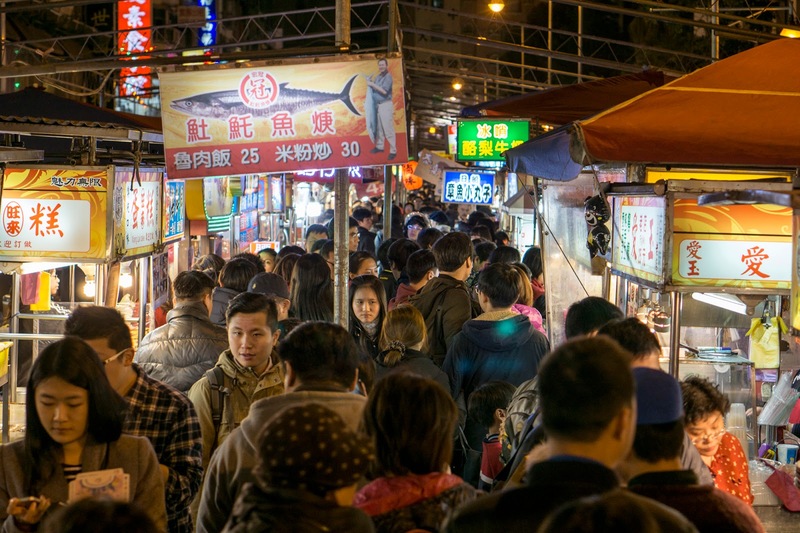 Night Markets. Shilin is the big one and seems to be the most referenced, but it’s tailored for tourists. 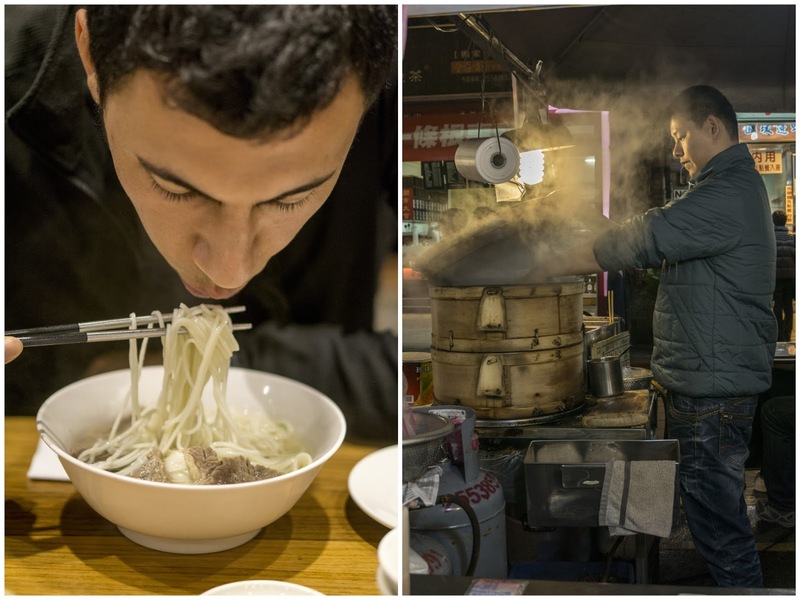 If you want a more authentic experience, head to Ningxia or Raohe. Either way, make sure you visit at least one of them. They kick off from around 9pm. Highlight. I can certainly tell you the highlight for Matt – being bumped up from premium economy to business for free on the flight from Delhi to Hong Kong, leaving me behind. Although he did sneak his tiramisu to me through the curtain – course five of his lunch..
For me, it was probably meeting the people I did this week – Feichi, and the good friend of my good friend back home in London, Annie. Lowlight. The powers that be have again been very kind to us this week – it went without a hitch. But we did walk an hour in the drizzle to Guanghua Electronics Market. It only closes one day a month, the last Tuesday, and that was the day we visited. Annoying. Hong Kong, I’m coming for you.